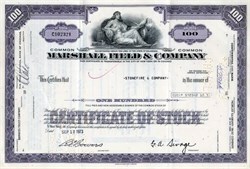 Beautifully engraved Certificate from the famous Marshall Field & Company issued during the 1970's and earlier. 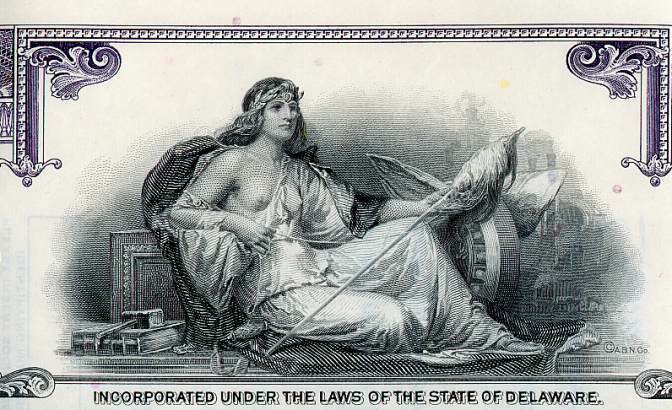 This historic document was printed by the American Banknote Company and has an ornate border around it with a vignette of an allegorical woman. This item has the printed signature of the company's president. Small check mark indicates redemption. Marshall Field (1835-1906) was the wealthiest man in Chicago of his time, worth an estimated $100 million when he died. Originally working as a clerk for Potter Palmer, he saved half of his $400/year salary, and in 1865 with his partner Levi Leiter bought Palmer's dry-goods store. Field and Leiter eventually became "Marshall Field and Company", which is now one of the most successful and widespread department-store chains in the world. Federated Department Stores, Inc. today announced a series of strategic decisions to build its nationwide Macy's and Bloomingdale's brands and reduce costs. These moves will help stimulate long-term growth in sales while taking full advantage of integration opportunities created through the merger of Federated and The May Department Stores Company, which was completed on Aug. 30, 2005. "To better serve our customers in this highly competitive retailing environment, we must concentrate on our best national brands and reduce costs so we can deliver outstanding value to shoppers," said Terry J. Lundgren, Federated's chairman, president and chief executive officer. "We believe that continuing to build Macy's and Bloomingdale's aggressively across America will accelerate our comp store sales performance and increase profitability, thereby driving shareholder value. "By announcing these decisions now, we can begin more specific planning for the future. This includes discussing potential career opportunities within Federated for May Company employees and ensuring new merchandise assortments are in place as soon as possible in stores acquired from May. We will begin buying and planning Macy's assortments this October so goods are in-store during the third quarter of 2006," Lundgren said. All stores, offices and operations will remain in place through the 2005 holiday selling season. The company reiterated its pledge that there will be no workforce reductions or job eliminations as a result of the merger prior to March 1, 2006. All decisions announced today are consistent with Federated's previously announced estimates to realize approximately $175 million in cost synergies in 2006 and $450 million in annual cost synergies in 2007 and beyond. Expenses associated with corporate and division consolidations and nameplate changes are included in the previously announced estimate of approximately $1 billion in one-time costs spread over three years beginning in 2005. All Marshall Field's stores will convert to the Macy's nameplate in fall 2006. This includes 62 locations in Michigan, Illinois, Minnesota, Wisconsin, North Dakota, Indiana, Ohio and South Dakota that will continue to be operated by the Minneapolis-based division that will become known as Macy's North. "From a shopping standpoint, customers will have the best of both worlds in major markets like Chicago, Minneapolis and Detroit. They will continue to benefit from regional buying that remains attuned to local preferences and lifestyles, plus enjoy the distinctive merchandise and shopping experience that's part of the Macy's brand," Lundgren said. "We have great respect for the legacy and traditions of Marshall Field's, and we carefully researched customer preferences and studied alternatives before making this decision to incorporate Marshall Field's into the nationwide Macy's brand," Lundgren said. "While the store's name will change, much of what customers love will stay the same, including Marshall Field's traditions and its outstanding record of community and charitable giving. As part of this name change process, we will do everything we can to honor the Marshall Field's heritage, particularly in its Chicago birthplace."